Support your high horsepower Mustang the right way with this 1994-1995 Mustang GT high performance fuel system! Add a fuel system that can support your high performance engine with this 1994-1995 Mustang GT high performance fuel system! This kit includes all of the components needed to support your forced induction Mustang. When you force more air in, you'll need to the fuel to keep up. This kit includes a new blow through mass air meter, high flow fuel pump, 47lb fuel injectors, fuel pressure regulator, and the correct injector adapters. The combination of these items will allow you to keep up with the increased airflow. We've compiled together some of the top quality brands for this fuel system. Starting at the source, this kit has an Aeromotive 340LPH fuel pump. This pump is gas and E-85 compatible and flows at 40psi (90psi max) which is perfect for forced induction applications. An Aeromotive fuel pressure regulator is included to dial in the pressure of your fuel. This regulator has a range of 35-70psi. Ford Performance 47lb fuel injectors are included to support up to 470hp @ 85% duty cycle! These injectors include the correct adapters for a direct replacement. Finally, we include a Pro-M 3" Slot Style Pro-Tube mass air meter. This is a "blow through" style meter for supercharged or turbocharged applications. This meter has room to grow and can support up to 800 flywheel HP. 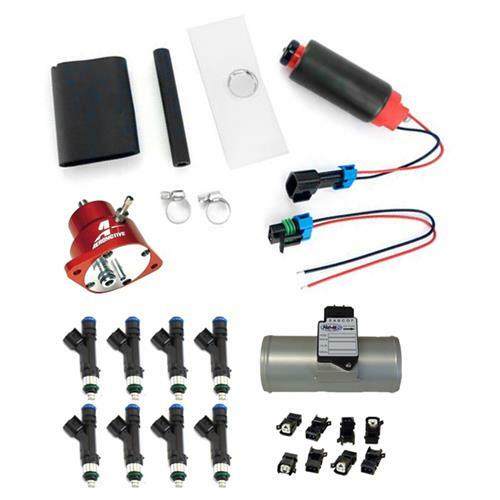 This kit is designed to work with On3 and Hellion turbo kits as an easy and cost effective fuel system solution for your Mustang. This kit will also work in Vortech, Paxton, and ProCharger setups with a custom inlet tube for blow through style mass air meters. This fuel system will support 550hp at the crank and 470hp to the rear wheels. Mustang fuel injectors are a vital part of your motor as they supply your engine with the correct amount of fuel for your application. Knowing your stock Mustang fuel injector size can help you in judging if you have the correct size injectors for your application. To see what injectors came stock on your Mustang, click on the chart below.